In most cases, surgery is necessary. 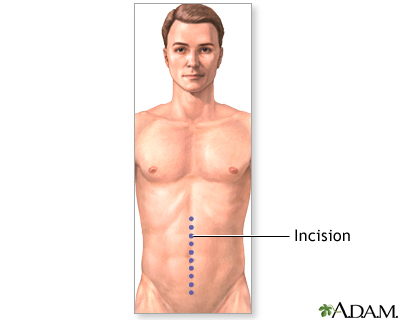 While the patient is deep asleep and pain-free (general anesthesia), an incision is made in the midline of the abdomen. In the case of adhesions, the adhesion is removed, thus relieving the obstruction. In the case of a hernia, the hernia is repaired. If colon cancer is present, cancerous areas are removed, which also relieves the obstruction. .